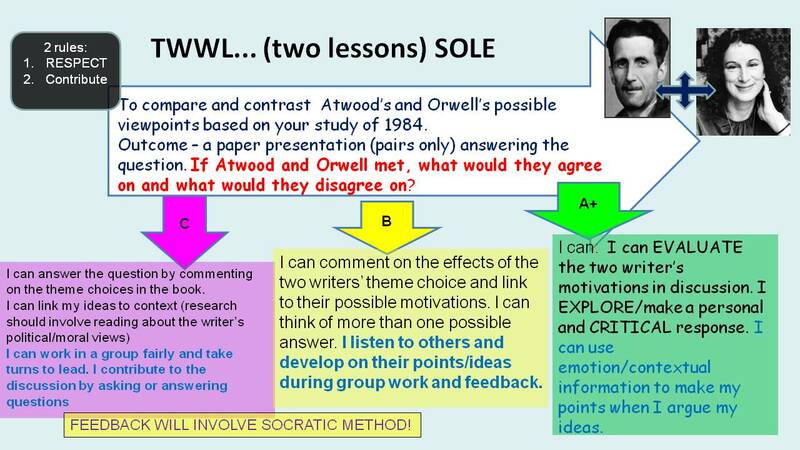 S.O.L.E, or: Student Organised Learning Environments. Handing over control to the students! Eek! In a nutshell: Ask a relevant, yet open question and allow the class to go forth and discover, in any way they choose. Yep – that’s right – any way they choose. SOLE has been used in many contexts and countries in order to meet Dr. John Hattie’s conditions for accelerated progress. International research* has proven this model is effective and is beneficial to young people in many other ways. Several schools are making it work in UK classrooms. The concept of handing control of a lesson over to students is a little daunting, but massively satisfying when it works. I hope, after reading this blog, you’ll give it a try and comment below. As a teacher I have only one brain, and only one (caffeine –addled) head to keep it in. More than this, I have a very specific outlook, and unique range of experiences. A “taught” lesson, albeit with “independent” elements, will often be restricted by my previous knowledge and understanding. Unwittingly, I may end up restricting my students’ progress through the very process of planning lessons. When the learning journey and conclusions are generated by students (questions, discussion, presentations, essays), we are likely to achieve a diverse set of outcomes that could not have always been predicted by the teacher. Not only this, but learning through SOLE tends to be deeper and more exploratory. The result (eventually) should be that students knock through the ceilings on their target grades. Once familiar with the process, students should naturally seek a high level of challenge. When they feedback their discoveries (and if you model good questioning) they will take class discussion to a higher level. When they’re ready, you can use advanced, yet simple feedback methods e.g the socratic circle. By trusting them (and training them) the students should feel empowered to work independently in any setting or context. greater student ability to manage their own feelings (esp with “delayed gratification”). enabled teachers to focus on Teaching and Learning rather than organisation/behavour. Ask students an open question and let them decide how they will answer it. Provide students with checklists (to aid self-regulation). After a while, this process should become internalized. Write clear instruction slips (if the class needs them). Teach failure/managing own feelings as part of the feedback process. Want to go further? Allow the students to choose their own groups and their own question. Before the day of the SOLE, think carefully about the question you would like to ask. Also think about the Success Criteria – can you link the subject-knowledge and skills, to the question. How much detail do they need? An example I used is pasted below. The question is in red. Please add your question ideas in the comments section. You may want to book a library space or an IT room. Students need some guidance on how to organise themselves at first. Some groups will take more easily to this method than others, while some individuals (particularly those with low-self-esteem who like to “passenger” by letting others work for them) may need motivation/rewards/sanctions in place until all are participating equally. The real, unexpected, challenge for me was when trying not to offer help or “micro-manage” my students. I had to force myself to circulate – ask the odd question but not direct their learning in any way. It was excruciatingly difficult to break this habit of “interfering”, however temporarily. As is the case with the teachers who use this method successfully, the trick is in asking the right question, and organising the follow up sessions, so that they allow for development of ideas plus higher-order thinking. What is your Twitter name and handle if you have one? Please feel free to contact me through @FarinaAckerman on Twitter. Where it all began (Sugata Mitra’s TedTalk on his very first SOLE experiments). Dweck, C (2007) Mindset: the new psychology of success (Ballantine Books). Gershon, M (2014) Classroom practice – Teach students to set themselves free (TES Magazine). Pintrich, PR (2000) “Multiple goals, multiple pathways: the role of goal orientation in learning and achievement”, Journal of Educational Psychology, 92: 544-555. Pintrich, PR, Schunk, DH and Meece, JR (2002) Motivation in education: theory, research, and applications (Pearson).